As a social media coordinator & marketer as well as a lifestyle blogger, I've done my fair share of blog writing, publicity, press, events, & pretty much everything under the social media sun. I've been on both the giving & receiving end of social media marketing, so I have first-hand perspective on what brands look for before working with a blogger. I've managed social channels for brands who focus on timeshares, sewing & embroidery designs, vegan energy bars, & more. Blogger outreach is the ideal way to get brands in touch with modern influencers. Whether you're a California lifestyle blogger or an organic mommy blogger, make sure your blog is on a brand's radar. 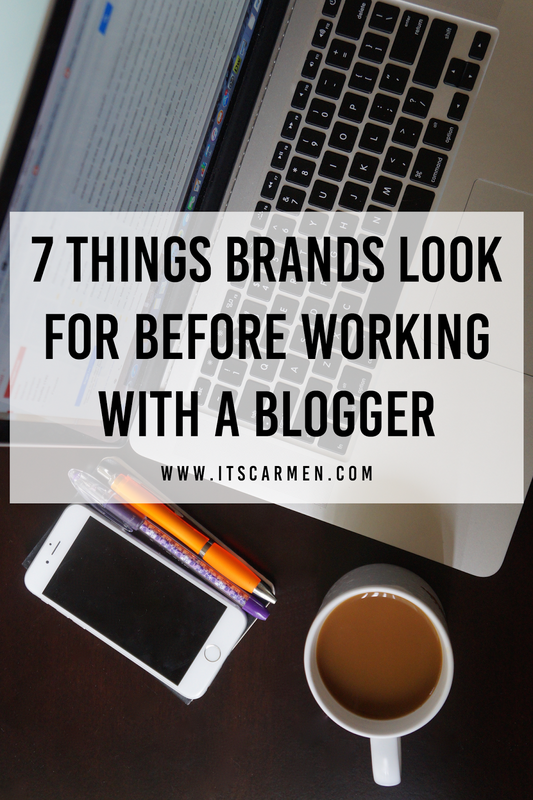 If you want to receive more inquiries from brands, read up on these seven things brands look for before working with a blogger. Before we get started, subscribe to my newsletter for more blogging & social media tips! Before a brand even gets around to reaching out to you, we scour your blog to look at your content, your writing, & your photography. We browse your content & photos to judge if a possible brand collaboration would work. We want good spelling & grammar. We want clear & interesting photos. We want to see your personality shine through your words & content. We view your past posts as a reflection of what a collaboration would look like. We actively look at all of your social media channels to determine if your blog is a good fit for us. After all, we are providing a service, product, or financial compensation to you & your service is exposure, website clicks, & potential sales for us. You don't have to have an enormous social media following. Count up your followers on all your social media platforms: Facebook, Twitter, Pinterest, Instagram, Tumblr, etc. My tip: sometimes it's more powerful to say, "I have 3,000+ followers across my social media channels," rather than "I have 907 Facebook followers, 750 Twitter followers, 824 Instagram followers, 500 Tumblr followers, etc." What good is a social media following if you never Tweet, update, or post? We're looking to see if you're active on social media channels by updating relevant & regular information to what we're selling. For example, a vegetarian jerky brand reached out to me because I Tweeted several times about being vegetarian. Engagement is extremely important! You can have a huge social media following but no engagement. You're more valuable to us if you have 100 daily views & 2 clicks to our website versus 10,000 daily views & 2 clicks. If you're lacking in followers, your engagement level may save you. If you have both a decent social media following & engagement that makes a wonderful mixture. All the above are great & everything, but are your readers who we are targeting? Your blog readers, their age, their location, & their habits, affect whether or not our brand is a good match for your blog. If we're selling candy bars but your blog focuses on healthy recipes, we're probably not a good pair. If you're a single woman in your early 20s, you may not be a good fit for our family-oriented timeshare rentals. Did you know that when brands send free stuff or pay for a sponsored post, that costs money? It usually comes from a yearly or quarterly budget set aside specifically for marketing, social media, or influencer outreach. Blogger outreach is costly & brands only have a certain amount of budget & inventory to give out, so we want to ensure that you will be a reliable blogger should we decide to work with you. How long does it take you to respond to emails? How often do you update your blog? What's your turnaround time for collaborative or sponsored posts? Do you have past examples? After we determine that everything about your blog is a good match for us, we look at your media kit, about me page, &/or sponsor page to find out more about you. We're trying to find your contact information, other brands you've worked with, your page statistics, & any readily available information. This is the final touch before we gather all the content we've accrued & either take it to a superior for approval or begin reaching out to you. You heard it from me everybody! This is a step-by-step guide in what brands look for before working with a blogger or pursuing blogger outreach. It's a tedious & time intensive process to find the perfect match for the brand, but if we are a good team it's well worth it. BUT WAIT! There are MORE tips! Sign up for a behind-the scenes look at blogging & entrepreneurship. Get access to exclusive insider info & pro tips! Thank you so much for these valuable tips and sharing them! Great info, thx for sharing. Some really good tips, thanks so much! It's great to hear it from someone who has really experienced it all! This is such a helpful post, Carmen! As one who does blogging as a hobby, I really don't quite bother with working with brands and such, but I'll definitely use these tips if I decide to go professional. Thank you! These are great tips...thanks so much for sharing! Great article Carmen! All such good info. This is such a great way to break things down! All mostly attainable and this helps to make everything easy to understand. This was such a helpful post, thanks Carmen! It's good to find out what brands are looking for, very helpful. I really liked reading this. I always wondered what brands go through to actually decide if they want to work with any blogger. We just get one perspective and can maybe gather a tiny bit of extra information, so this was very helpful for me! These are great points! It's a great reminder to look at things through a brand's point of view every once in awhile and not just the reader's viewpoint! It's always great to work with brands. It usually feels so great. I am so grateful for the tips. Thank you for sharing. Great tips! I haven't worked with a brand yet but these tips/points are very helpful. Thanks for these tips! I've heard about media kits before but I wasn't completely sure what information they should have. No worries, Alina. Sometimes a person isn't chosen due to a small detail that the brand wasn't at liberty to disclose. For instance, you may have hit every qualification they said they were looking for (age, location audience, social following), but they might not have mentioned they're specifically looking for someone who has children under 5, or for someone who blogs but still has full time job. Great and helpful tips. Thanks for sharing! Hi great tips! 😀 Thank you! I have one persona/brand I have good numbers for, but with my new blog, is it ok to do a media kit when your stats aren't that high yet? Advice? Hi Carmen! Thank you so much for your tips. It's really interesting to read all of your blog posts about blogging! 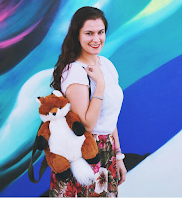 I graduated in May with a communications degree and started blogging as a hobby because I love to write. You do such a great job explaining the qualities of good blogging and the processes of branding and engagement! SO helpful for those of us just starting out!